Let’s do a thought exercise together. I have flown, I don’t know two or four times a year since I was eighteen and a few times before that, and I am now almost thirty-seven. On the low end that puts me around forty times. On the high ends that is, what seventy-five times in my life? Let’s split the difference and say I have flown fifty-five times because I have never kept track of things like that. Also, I have jumped out of planes before. Yep, it was beautiful, and seriously it is only the first step that is the hardest, because after that you are totally involved. So, if that is something you want to do, just close your eyes and step out. But I digress. Recently (over the last two years), I have become terrified to fly. I blame it on a trip where I had a bit of what I would consider severe turbulence. Really, though, it has just been a growing fear. With each flight, with each significant life event I have been ill prepared to handle, with each death I had to fly home for, the fear and anxiety has quietly and sometimes loudly and harshly grown. Most flights I have not enjoyed. However, there was a time I do remember when I loved to fly. The spooling of the engines, the way you are pushed back into your seat at take-off, that moment of lightness you feel right at the top of the take-off. I loved watching out the little window as the people, trees, and buildings would get smaller and smaller as you climbed to altitude. I even loved when we would fly over different farm areas and see the different colored plots of ground. Then there is the opportunity to watch the sun rise and set from 30,000 feet in the air. Morning flights are so great for this. It’s just darkness with little color lights below, but as you watch out into the darkness, the nothingness, slowly the darkness begins to turn into these beautiful, rich, and warm reds, yellows, and oranges. They pull across the sky and stretch into memories and dreams almost. And the clouds, I love the fluffy ones, the heavy, wintry ones that are filled with a mixture of snow and rain, and the long, airy ones. These are my favorite; they stretch and dance across the sky like little fairy wisps. When I think about it now, safely on the ground, it feels beautiful and calm. Picturesque as I travel to some place beautiful that is full of opportunity to explore. Flying offers me a mixture of beauty and fear. The last time I flew was the worst I have ever had. The flight itself was merciful and calm. However, I have never had a panic attack that severe before. I knew I had to fly. I didn’t want to. With every fearful bone in my body, every muscle tensing at just the idea of leaving my house, I really didn’t want to. But I had to. I tried to figure out how long it would take to drive, if there was a way to cancel, if I could just say no. Those weren’t options. I had to fly. So, I did my preparations. I have been a long believer in cognitive based therapy and the thought records my therapist has used to help me. I did as much research as I could on statistics of flying, specific airlines, the best time of the day to fly; I watched turbulence maps, checked weather forecasts as well as historical weather maps. I read safety numbers and statistics galore from reputable and not-so-reputable places on the internet. I found calming techniques like writing with your non-dominant hand over and over again, listening to quiet and calming music (I chose loud and high-based EDM), and coloring. I even got prescribed medicines from my primary care physician to take the edge off. I did as much preparation that I thought I could. But I was still afraid. My body ached and pulled from all of the adrenaline. I was terrified in a way that I have never been before, and even with the medication my doctor gave me to calm my nerves, the thought record in hand, and coping mechanisms in place, it was still incredibly hard to get on the plane. I almost didn’t do it, and if I didn’t need to get there by a certain time that day, I would have driven the fourteen hours to my destination. It is amazing how fear can control us, can take us to that lizard brain level and win. That’s a hard and harsh reality for me because there are so many places I want to go. So many things I want to see and experience. Not everyone wants to travel. Not everyone has a calling to their soul that says, “But what’s over there?” What have you not seen, felt, or experienced that could be just on the other side of that mountain? But I do. I am a traveler at heart. There are so many places across this world that are filled with cultures and history I have not seen or experienced in the very real sense of just being present in it. Where you can taste the excitement, feel it in the air and in the music that has its own unique song for those who listen close enough. I love going new places, meeting strangers, breathing in the experiences with every breath. I crave that. I dream about it. And of course, I save pictures and research these exquisite places and daydreams to my Pinterest boards because I am unsure I can break the fear enough to go. That is until recently. I had a moment of pause the other day. A moment of realization that struck a chord so much that I am writing to you. I have this pain in my leg. It has been here for months and when I called the doctor to schedule they immediately thought it was a blood clot and sent me directly to the emergency room. After many tests, they determined it wasn’t a blood clot in my big important veins and sent me home. I still have no idea what it is or why it causes me so much pain, but I know it isn’t a blood clot. However, a few days ago it was aching noticeably again and a moment of “oh gosh” hit me. Being an anxious person, the immediate question of “could it be cancer?” came to my mind. For many people, I am sure that question probably doesn’t pop up. But my mother got cancer at thirty-eight, and my thirty-seventh birthday is less than a month away. It was breast cancer and she’s fine now. But my stepdad died of cancer two and a half years ago. Watching his experience of slowly getting sicker and sicker and the cancer spreading across his body still haunts my thoughts. For the record, his was also not cancer in the leg. But sometimes your mind just starts with an idea and attaches to it immediately and starts going with the what-ifs. At that moment, though, I didn’t play out what-ifs; I didn’t think about the medical procedures and things I would have to do if it really did turn out to be cancer. My thoughts did not do the dizzying spiral they normally do. I had only one thought at that moment. I went immediately to the looming fear of flying and my desperate, aching desire to see more of the world and asked myself if this was really cancer, if there was a sickness that was about to affect my entire life, would I no longer be petrified of flying? I realized at that moment I have a 100 percent chance of dying. Absolutely, unequivocally, I am eventually going to die. And it very much could come from this random pain in my leg, from cancer, or even from a plane crash (although statistically I have a much greater chance of the cancer than the crash). But I realized something I had never before, and that is I could die today. Now don’t get me wrong, I have had many days and thoughts of dying over the years. Through weird and not even logical ways of dying. But this moment was real, was higher than my lizard brain fears, was calm. And I had to decide, am I going to do the things I fear so I can see the things I dream of? I realized it’s okay that I am still afraid, it’s okay that I need medicine from my doctor, strong coping mechanisms, and research, but I have to go. If exploring is important to me the way I feel it is, then I am going to have to explore and accept that anxiety and fear might be traveling companions, but they do not have to be roadblocks. Not anymore. So, I am writing to you, people I don’t know, who may experience similar things, who may be terrified of flying too, to offer you this simple yet real realization. I am still very much afraid today, but I am going to book my next flight and leave room for my anxiety and fear to come along. Maybe one day they won’t accompany me on my trips, but I know I am going to ensure they do not stop me in the meantime. Stacey Mitchell is an artist and writer living in south Texas. Professionally she works in cyber security and has previously worked as a research analyst and cyber instructor. She loves to travel and explore with her daughter, whether that’s exploring somewhere in their town or somewhere across the globe. 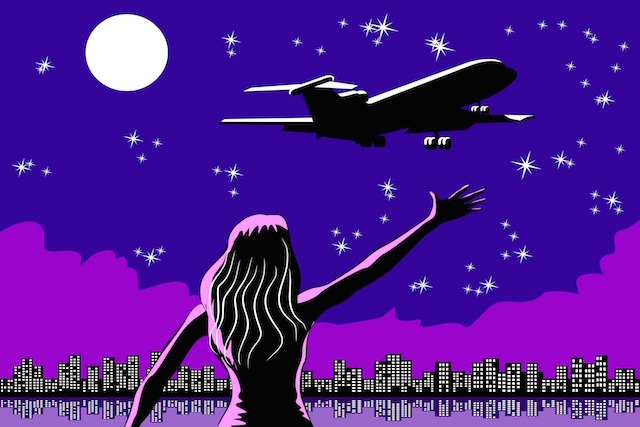 The post Yes, I Am Afraid to Fly, But I Won’t Let My Fear Control Me appeared first on Tiny Buddha.